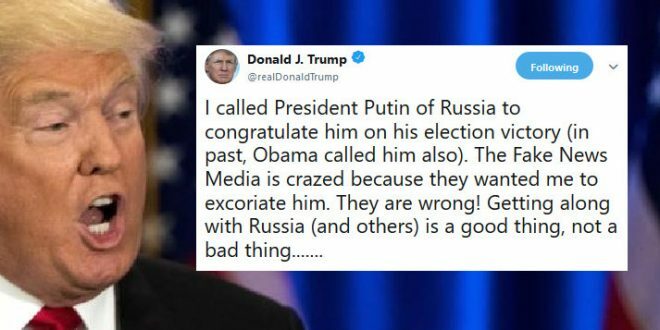 Trump Attacks His Predecessors In Defense Of Putin Call: We Need Russia's Help In The "Coming Arms Race" - Joe.My.God. President Donald Trump on Wednesday criticized his three predecessors in defending his recent congratulatory call to President Vladimir Putin of Russia — a move that’s been widely criticized in the wake of news that Trump was specifically instructed not to congratulate Putin on his reelection. Reports emerged on Tuesday night that briefing materials prepared for Trump’s call specifically said “DO NOT CONGRATULATE” and further recommended that the president condemn the recent poisoning of a former Russian spy in Britain, which the United States and several allies have blamed the Kremlin for.